PREX17 insights on creating a playbook for preservation that is litigation-ready. 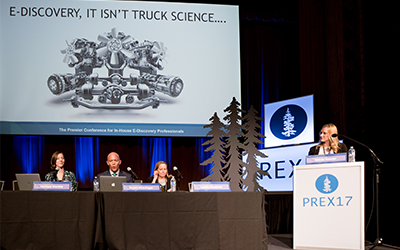 PREX17 conference session summary offers tips on building a corporate legal preservation playbook for litigation response. Do you have a legal preservation plan? Defensibly managing preservation is no easy task. Without proven tools and rules for legal holds, data deletion, custodian communication and outsourcing files, your preservation approach can be a liability for your company — bloating production times, draining budgets and increasing risk. Cortney Starble, E-Discovery Specialist at CBRE, Inc.
Don’t miss their practical tips on creating, monitoring and documenting preservation processes that are litigation-ready. This session summary outlines the best practices aimed at helping legal operations teams lower costs, mitigate risks and empower clear preservation workflows. Tap in for ideas on building a plan that earns more wins for the team. Questions about corporate legal preservation?